Delightful! Good Day is all about staying positive. The song features Issam Kamal, who sings a few verses in Arabic. I’m not too sure if a nasheed should make you want to get up and dance but his part certainly does – I like it. The track is lively and unique – certainly not your everyday nasheed. The lyrics have good meaning too. Maher sings about having a positive mindset and viewing each day as a fresh opportunity to do good. Seeing every day as a good day is a nice thought, but how practical is it? One of the best examples we have is the story of Yusuf (PBUH). Prophet Yusuf went through many hardship; he was betrayed by his brothers, thrown down a well and unjustly put into prison. Despite this he was able to stay positive and saw his life improve drastically. Yusuf had a number of negative experiences during the early part of his life. His brothers heard about his positive dream and therefore plotted against him, throwing him into a well. He was then seduced on two occasions and thrown into prison, despite clear evidence that he was in the right. During his time in prison he was given the gift of interpreting dreams, which aided with his release. The women then cleared his name by confessing that they were in the wrong. Yusuf was then put into a position of power, and confronted his brothers who then learnt their lesson. The story ends with his Father, Mother and brothers all bowing down to him – a confirmation of the dream he had in the beginning. How does the plot relate to Maher Zain’s track? One interesting point about the plot is that item 1-6 are negative experiences, while items 7-12 are positive. Despite going through so much difficulty he remained patient and positive. Prophet Yusuf’s life was not only made better, but saw a significant improvement. The story of Yusuf teaches us to stay positive. No matter how difficult our life is we should treat every day like a new beginning, as Maher says in the song. Did you notice the ring composition? Another interesting point about the plot is that line 1 and 12 are linked; line 2 and 11 are linked and so on until we get to the middle. This is known as ring composition – a common occurrence in the Quran and a sign that the book is indeed from God and not a human. Other parts of the Quran which include ring composition include ayat-ul Kursi and Surah Baqarah. Let us now present the lyrics to ‘Good Day’, calling out references to Quran and Hadith. This is always my favourite part of the review! Allah tells us to put trust in him, so we should – simple! We’re living in a time where people prefer to listen to idle songs over ones with meaningful lyrics. Traditionally this was because the meaningful songs were lacking in production, and sometimes cheesy. Maher and other like him are changing this with good produced music while maintaining positive lyrics. I really like this song, and have repeated it many times in my car. 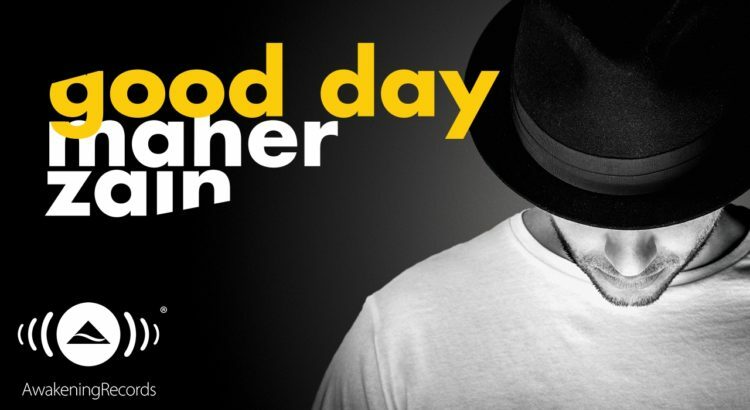 Maher Zain sings in multiple languages, this song is available in Arabic and Turkish too. Those who understand the languages tell me: is the song just as good in your language?